Many locals are shocked to discover a real, working farm in the heart of Irvine, Calif. Tucked away from the city atmosphere, Tanaka Farms is thriving. While at Tanaka Farms, one cannot even see or hear the freeway mere miles away, making for a nice getaway from busy city life. Shopping centers and residential area surround Tanaka Farms, however, it is a different atmosphere. Tanaka Farms works to feed people the healthiest fruits and vegetables. Also, Tanaka Farms provides education by means of tours, showing kids where food they eat comes from — not exclusively the supermarket. Tanaka Farms began in 1941 with great-grandfather Teruo farming in Northern California. Post war, he came to Huntington Beach, moving to Irvine in 1998. Farmer Kenny is a 4th generation farmer, with the addition of tours established when he was in preschool. Farmer Kenny recalled his mom giving him and his young friends tours around the farm, showing them all of the different produce. However, when Tanaka Farms lost their main produce stand in Cypress, a main source of income, tours became vital to the business’ success. By means of word of mouth, the tours became a larger part of the business. Today, social media has been a main factor in promoting weekend tours. Anywhere between 400 and 1200 people visit Tanaka Farms each weekend, primarily families with children. Tours provide a unique hands-on experience, quite different from the typical trip to the grocery store. Tanaka Farms also hosts a cookout tour, which is a farm-to-table experience; after harvesting produce on the tour, a meal is prepared. While on the tour, each child is encouraged to try a least a bite of the produce. Many even try green onions and bok choy; however, if they do not like it they are able to spit it out over the edge of the wagon. Since the produce is fresh, it tastes better. Since Irvine does not experience drastic shifts in weather throughout the year, over 65 varieties of fruits and vegetables are grown throughout the year. Tanaka Farms takes great pride in keeping all produce seasonal, which aids the growth of Tanaka’s Community Supported Agriculture (CSA) program. The CSA program sources produce to local residents via the produce stand. Once signed up for the CSA program, a family receives boxes of produce on a regular basis. Since the produce is fresh, more nutrients and vitamins are present. The longer produce sits on the shelf, the more nutrients are lost. All of the items in the produce stand are picked the day of or the day before it is sold, with hours from 9 a.m. to 5 p.m. every day. Farmer Kenny noted that responsible farming practices are upheld, including crop rotation and organic fertilizers, with organic produce being sold as much as possible. In addition, schools can participate in signing families’ up for the CSA program, receiving 10 percent back as a fundraiser. Summer is the perfect time to visit Tanaka Farms. 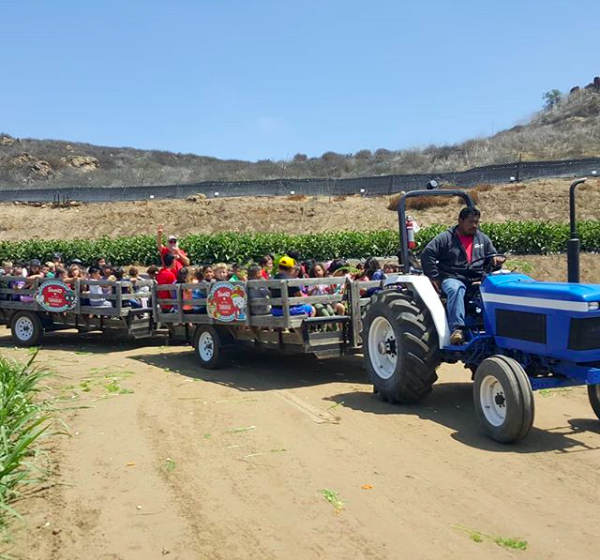 While Tanaka Farms’ tours are typically geared toward younger audiences, teenagers and adults alike enjoy the experience, as well. Not only are Tanaka Farms’ tours a good educational experience, they promote healthy, local eating. Visit Tanaka Farms to support local farmers and take a day away from busy city life.